Today's food is infused with sweeteners and fat to get you to consume more. Don't be fooled. Instead, sidestep the battle of willpower altogether. Have you ever found yourself staring at an empty bag of cookies you just devoured? Don’t beat yourself up. 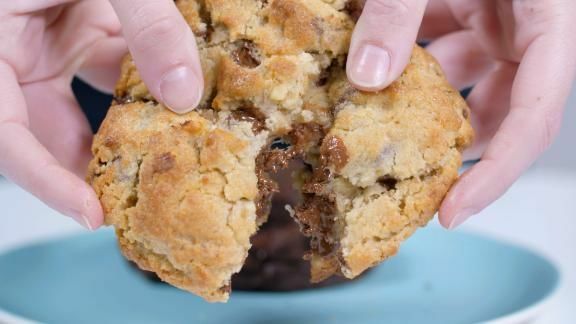 Your brain is wired to eat that cookie — and the next 10. It’s as automatic a response as running away from a loud noise. But resisting the cookies (or chips, or cakes, or chocolate-covered pretzels) doesn’t have to feel like a constant cage match between willpower and craving. You can use the same science that food manufacturers use to make junk foods biologically irresistible to your advantage. Why can’t I just crave carrots? To our caveman ancestors, sugar, salt and fat were necessary for survival, so they evolved to crave it. But since those foods were rare, our ancestors didn’t need much in terms of willpower. That’s why the region of our brain that regulates willpower is evolutionarily younger and easily overridden by the more primitive cravings-driven region. But in the past 200 years, we started producing foods that are nothing but straight sugar, salt or fat. Our environment changed, but our brains and bodies couldn’t adapt to the sudden onslaught of junky but highly rewarding food. Junk foods specifically triggers our brain’s “reward zone,” the same area where drugs and alcohol act. Every time you eat sugar, your brain releases dopamine (the happy hormone), and you feel good. In fact, food manufacturers spend millions to find the “bliss point” for each food: that irresistible ratio of sugar, salt and fat. These foods bypass our normal fullness mechanisms, which is why you could eat them all day and not feel full. Over time, your body becomes less sensitive to these foods, so you have to eat more just to get the same dopamine rush and feel withdrawal if you don’t get it. It’s like a designer drug in an easy-to-open package. Also, since our brains love sugar, food manufacturers have added it to pretty much everything. Today, 74% of grocery store foods have added sweeteners, including salad dressing, barbecue sauce and pasta sauce. Kid-specific foods average 85% more sugar than the adult versions. Not only does sugar add calories, but hidden sugar is like giving your brain a constant “hit” that only amps up cravings. We’re first going to end the cage match between cravings and willpower. In my work, I’ve found ways to sidestep the boxing ring with what I call Minimum Viable Actions: the smallest, most science-backed steps that can trigger healthy behaviors with the least possible effort. Don’t start by trying to resist that cookie head-on. To tackle sugar cravings, first reduce the hidden sugars in your diet, and over time, you’ll become more sensitive to sweet (and need less). Unfortunately, food labeling laws means you need to be a sugar sleuth; some juices labeled “no added sugar” have more sugar than a can of soda! How to tell? Follow my “Rule of 5s.” Read the first five items in the ingredients list to look for sugar by any name (there are more than 60 potential names): anything ending in “-ose,” “cane” (sugar, crystals), “corn” (syrup, sweetener), rice syrup, honey or others. If it doesn’t pass the Rule of 5s, it’s a dessert, and you should find an alternative. Second, embrace new flavors. Most processed foods are based on sugar and salt. But we forget the three other big ones: sour, bitter and umami. These three flavors have a lower satiety threshold, meaning they’re more filling, without salt or sugar. Dress up meats or vegetables with umami flavors (pickled vegetables, cured meats, mushrooms, tomato paste, miso soup, low-sodium soy sauce and hard-aged cheeses such as Parmesan) for a hearty flavor. Over time, you’ll notice salty cravings start to fall. Third, maintain portion control when it comes to high-bliss-point foods. We don’t stop eating these kinds of food when we’re full, we stop when the food in front of us runs out. Use that to your advantage. When people are given several smaller individually wrapped bars, they’ll eat substantially less than if they’re given the same total amount in a large chocolate bar. So acknowledge your caveman brain and scoop out a set portion. Even if you still go back for seconds (totally normal), you’ll eat less than if you had the entire bag. So, when you hear “Betcha’ can’t eat just one,” that’s not just a cutesy slogan. It’s a promise. Or a threat. Don’t try to fight it head-on. If you want to win, get out of the boxing ring.